So what exactly is “extremist material”? 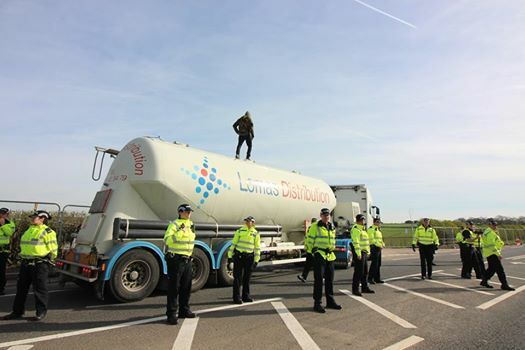 Resistance to fracking in the UK has moved up a significant notch over the last two weeks, with the launch of a series of actions against the whole support infrastructure for the toxic industry. The Break the Chain initiative is continuing until Monday April 10, so there are a few more surprises in store yet – see here for updates on actions. Even as this bulletin was being completed, on the morning of Friday April 7, news came in from the north of England of a blockade of PR Marriott, supplier of drills to the fracking industry. There was a tripod, three lock-ons and a banner drop. 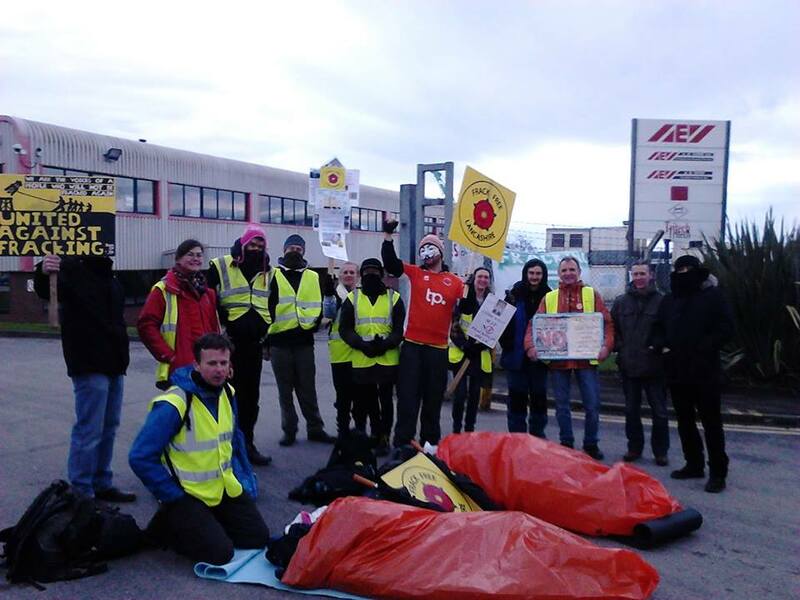 Opponents of fracking in Lancashire blockaded the gates of fracking contractors A.E. Yates in Bolton. 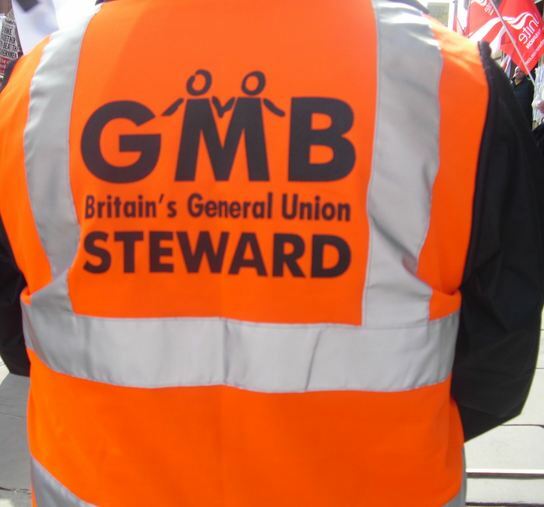 Road haulage firm Eddie Stobart also had its depot in Warrington blocked. This was part of successful ongoing local campaign, which previously saw quarry operators Armstrong Aggregates cancel a contract to supply AE Yates and drilling firm Cuadrilla with materials for the building of the shale gas exploration site at Little Plumpton after dozens of Bolton Against Fracking protesters targeted the Montcliffe Quarry. 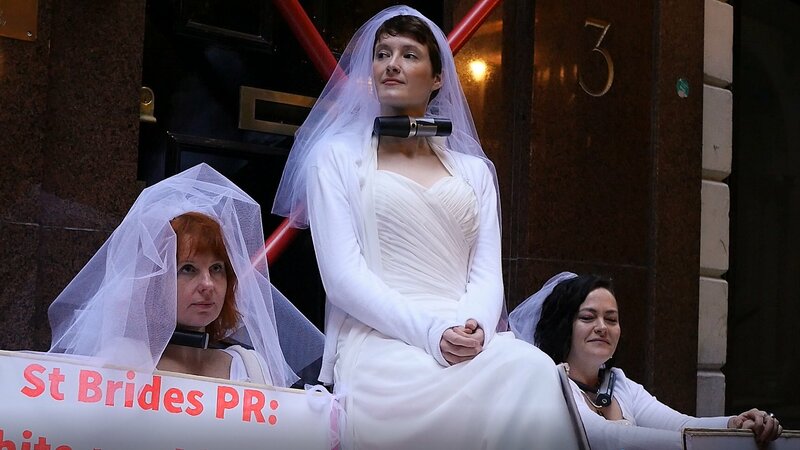 Three protesters dressed as brides chained themselves to the door of London PR firm St Brides Partners, declaring that PR firms that are “wedded to the fracking industry are locking the UK into a toxic marriage that funds dangerous and unwanted unconventional oil and gas in the UK”. 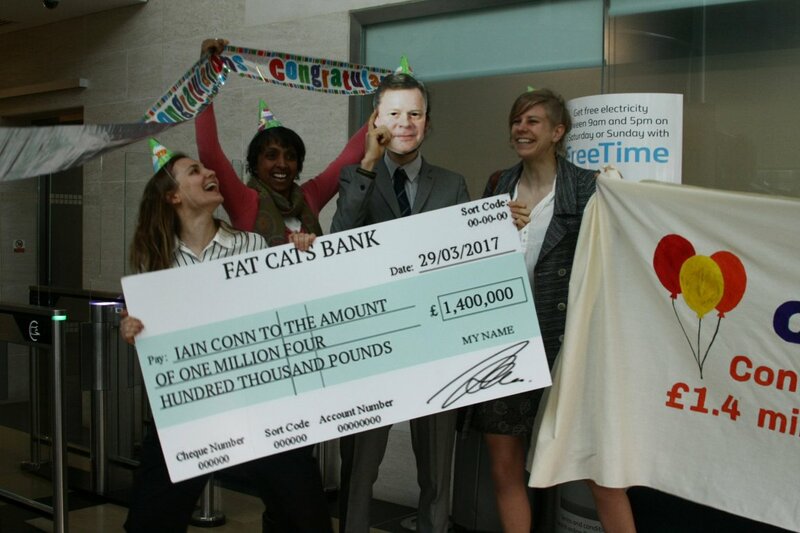 A group of anti-fracking campaigners held a party for Centrica’s chief executive, Iain Connor, at the company’s head office, to “celebrate” his £1.4m bonus. 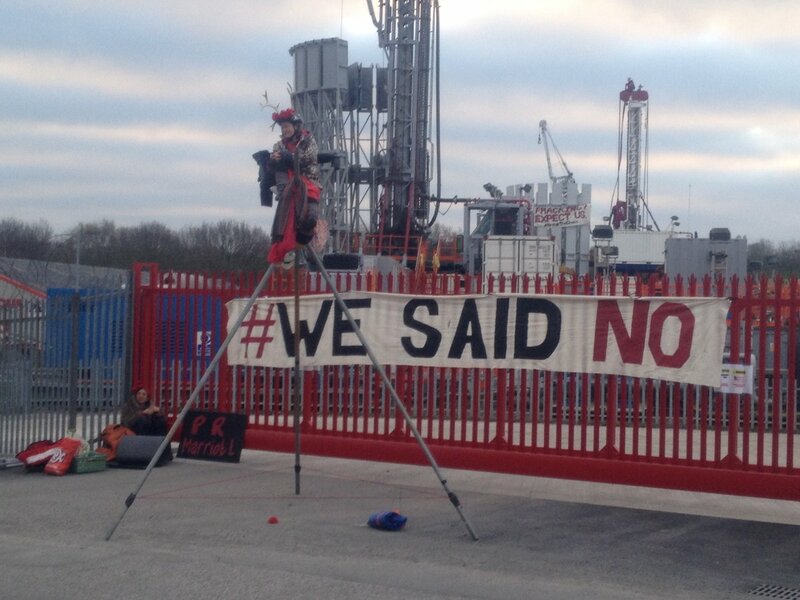 Cuadrilla’s shale gas site at Preston New Road, Little Plumpton, Lancashire, was closed by protesters. Activist clowns staged a wrestling match outside Barclays in Piccadilly Circus, London, in protest at its 97% stake in fracking company Third Energy. 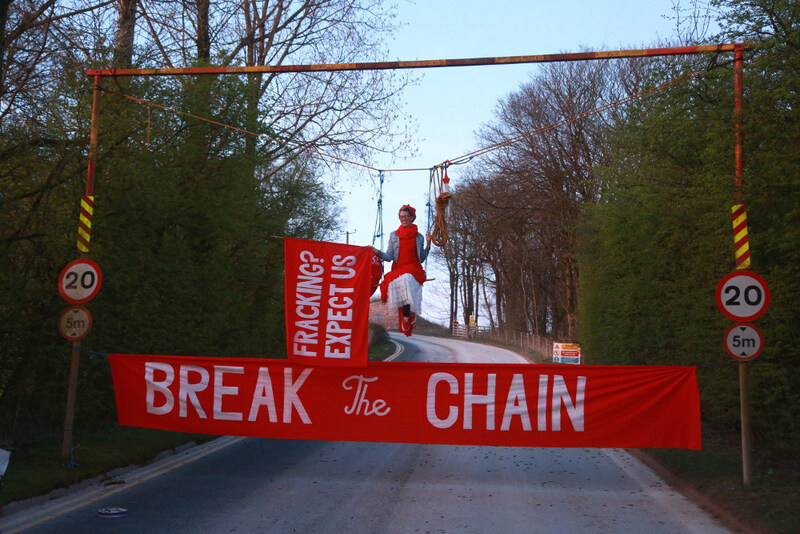 With at least five companies in the fracking supply chain having already pulled out after public pressure, the strategy behind Break the Chain could well have found a weak spot in the enemy’s armour. We can now expect the fracking industry and their friends in high places to step up their efforts both to intimidate opponents and to demonise them as dangerous “extremists” (see below). Three significant victories have been won in the struggle to protect the countryside in Sussex, England, in recent weeks, showing once again that determined local resistance can pay off. 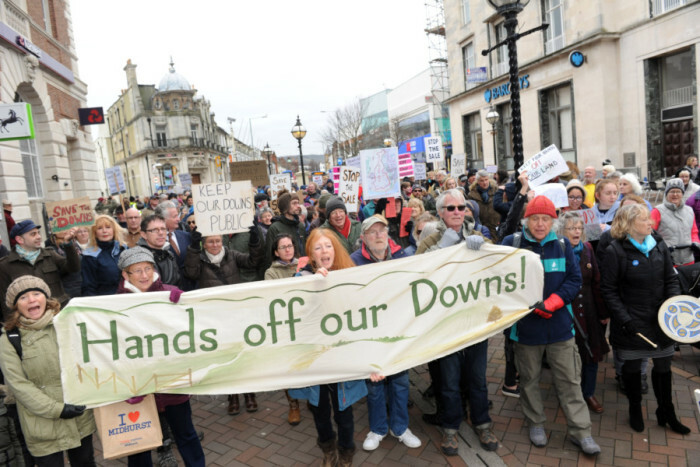 Campaigners in both Eastbourne and Brighton have now joined land-defenders in Worthing in having defeated sneaky council proposals to sell off publicly-owned downland. In Brighton the council’s U-turn came as a result of what Green MEP Keith Taylor called “an organised, passionate and energetic campaign to stop the sales”. 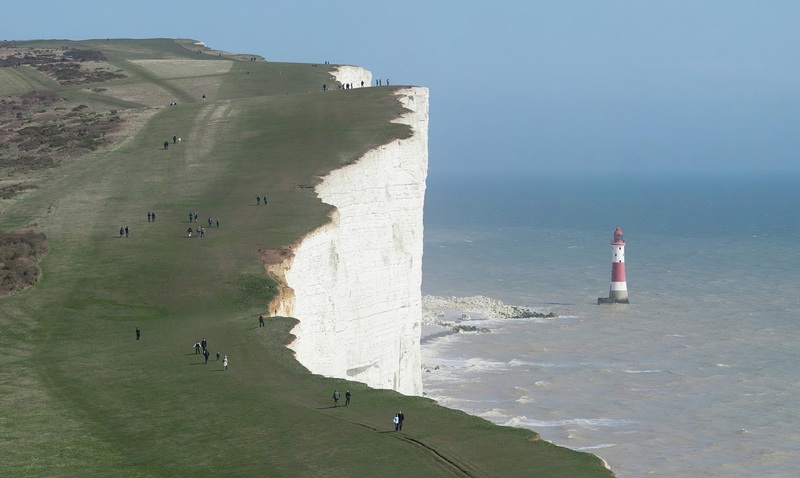 Eastbourne council was forced to concede defeat, after a cunning plan to persuade people to vote for the land sell-off spectacularly backfired. 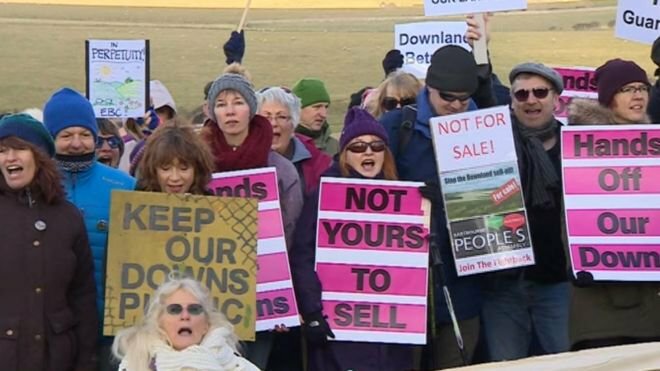 Locals saw through the false choice of either “service cuts” or “downs sell-off” and 75% of them voted for the (supposed) cuts and thus in favour of protecting the downland. The depth of feeling behind the Eastbourne campaign was apparent during a ceremony on the Downs in which the land was declared to be sacred to Sussex people, in the same way as the threatened land and water at Standing Rock in the USA are sacred to the Sioux people. Campaigners were told: “This land is our land, not only because we own it, but because this is sacred land, the land where our forebears are buried in the barrows we see across this land. “This land is the land of our ancestors, and we would not be here, not be the people we are today, without them. Just as we honour our ancestors today in this ceremony that reconnects us with them and with the land they cared for, so we honour our ancestors by fulfilling the sacred trust placed in us by the people of Eastbourne in 1926 to care for this land. “And care for it we must, because, as the Standing Rock Sioux have shown by their shining example, we have to stand up as the Water Protectors of our time, in this place, on this, our land, because this land is also our source of water. This land is the aquifer that supplies our drinking water and makes it safe enough to drink. As the Standing Rock Sioux say so well, Water is Life. Without Water, there is no Life. The third Sussex victory came in Chichester, where the government scrapped plans for £250 million A27 road “improvements” in the face of what it called “significant local campaigns”, just days before Highways England was due to announce its preferred route. The local business lobby, along with its placemen on the local council and its cheerleaders in the local media, have reacted furiously to the news and are trying to pressure the government into reinstating the road scheme. These road enthusiasts would do well to have a look at the latest report from the Campaign to Protect Rural England (CPRE) entitled: The end of the road? Challenging the road-building consensus. This shows that all the talk of new roads “easing congestion” is baseless propaganda. 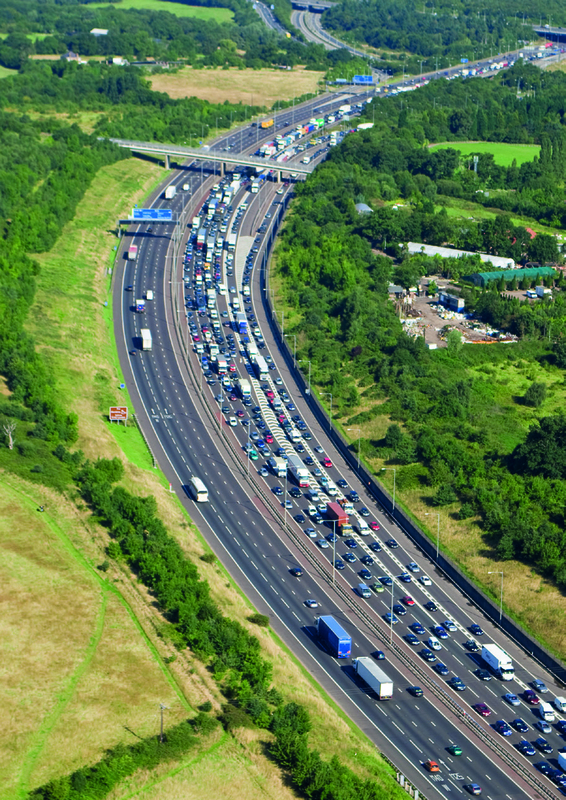 The CPRE’s Shaun Spiers commented: “Evidence from the 13 cases analysed in detail for traffic impact concluded that road schemes generate more traffic. On average, traffic grew 47% more than background levels, with one scheme more than doubling traffic within 20 years. None of the four schemes assessed in the longer-term showed the promised reduction in congestion; all put pressure on adjoining roads”. And, he added, the price to pay was a high one: “Sixty-nine out of 86 road schemes examined had an adverse impact on the landscape – not just obliterating views, but destroying ancient woodland and mature hedgerows. More than half damaged an area with national or local landscape designations for landscape, biodiversity or heritage”. If the authorities choose to take no heed of polite warnings from the likes of the CPRE, then it will be down to the people themselves, in Sussex and elsewhere, to launch more “organised, passionate and energetic” campaigns to protect the sacred land to which they belong. The French state is facing a major uprising in one of its remaining colonies in South America. 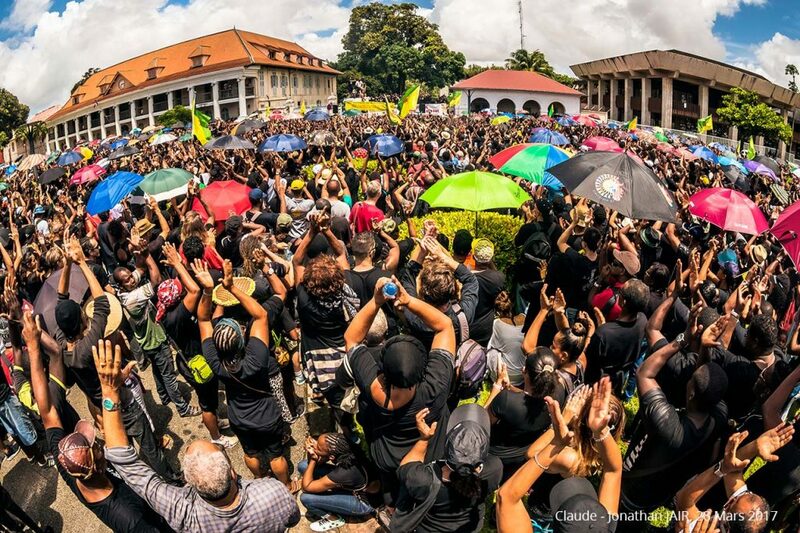 French Guiana, an overseas territory which is officially part of France and the EU, has been brought to a standstill by a general strike and massive social protest movement. 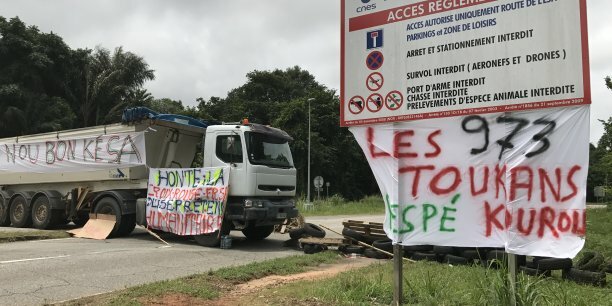 Roads have been barricaded, businesses closed and protesters this week temporarily occupied and shut down the Guiana Space Centre at Kourou, where European Ariane rockets are launched. French Guiana is an Amazonian territory north of Brazil, which is the size of Scotland but has a population of only 250,000. The people’s grievances are varied, broadly boiling down to the fact that they feel like second-class citizens who are ignored by Paris. While the French state benefits from the prestigious rocket launch site, 15% of the local population has no drinking water and 44% of the children leave school at primary level. 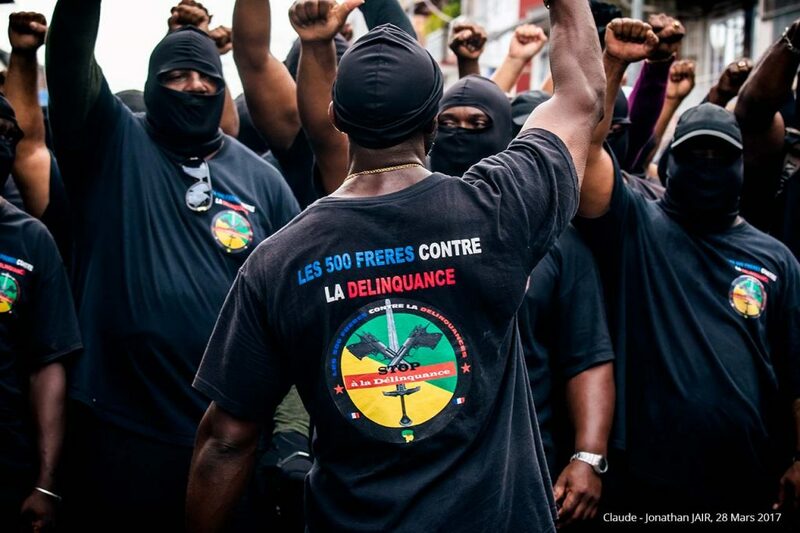 A very high-profile protest group called the 500 Brothers are calling for more security in a country hit by crime – and their appearance and rhetoric has alienated many of the uprising’s potential supporters in Europe. 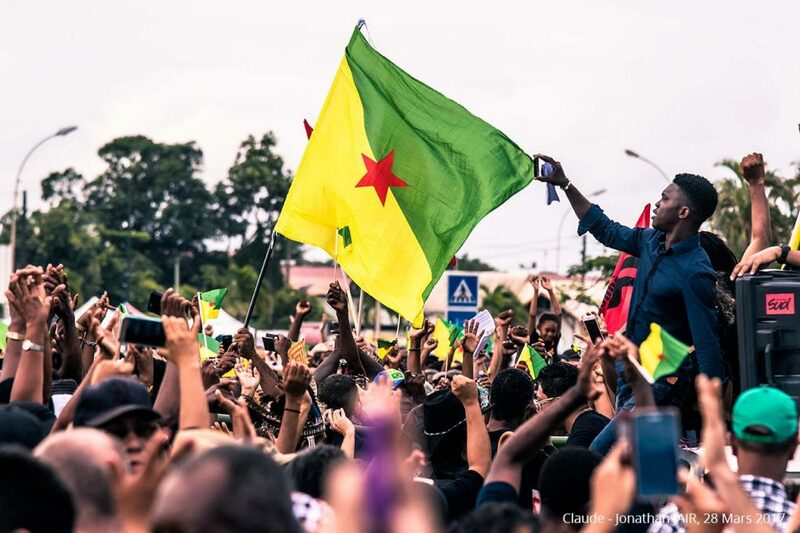 But another French commentator said: “We are all Guianese because the contempt they are feeling from the ruling class echoes the general feeling that is being voiced everywhere in France. The British state is trying to overturn an important legal victory in the fight against the arms trade. 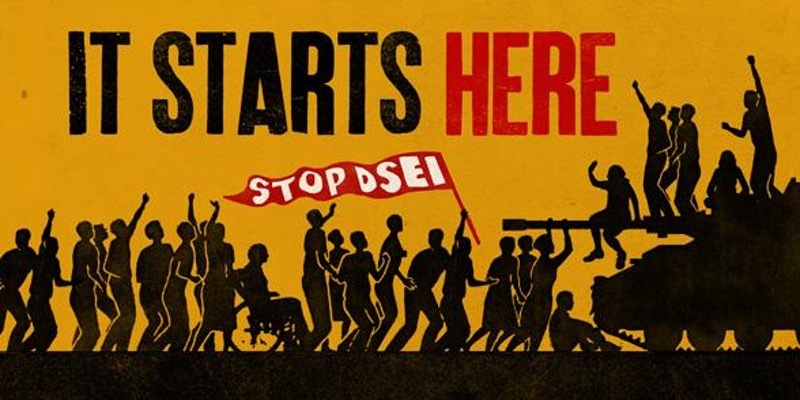 On 15th April 2016, eight activists were acquitted at Stratford Magistrates Court in London of obstructing a road outside the DSEI arms fair the previous September. They successfully argued that their actions were justified, as they were trying to prevent greater crimes taking place, including the marketing of torture weapons, repression in Bahrain and the mass indiscriminate killing of civilians in Yemen, Palestine and Kurdistan. Following the verdict, the UK state’s Crown Prosecution Service twice sought to appeal the acquittals, but was turned down on the basis that the CPS applications were “dishonest”, “frivolous” and “misconceived”. 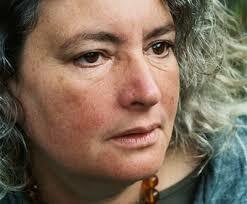 The CPS finally applied directly to the High Court seeking a judicial review of the activists’ acquittal. It is hardly surprising that the UK state is desperate to overturn a verdict which directly challenges its support for, and close collaboration with, the arms industry and the regimes which buy its products. It does not even dispute any of the facts found by the Magistrates Court as to wrongdoing at the arms fair and complicity of its regular invitees in ongoing war crimes. It simply says that the judge should not have allowed this evidence to be heard. From the state’s point of view, the judge’s decision was outrageous. That’s not how the law is supposed to work! That’s not how the game is meant to be played! The law was devised in order to protect Power and to justify the violence used by Power. If you are an enemy of Power, blocking a road is a crime. If you are a friend of Power, killing or torturing people is not a crime. It’s not about “right” and “wrong”, but about “legal” and “illegal”. And it is Power which decides how “legal” and “illegal” are defined. Andrew Smith of the Campaign Against the Arms Trade (CAAT) said: “The campaigners should not be getting pursued for protesting – it should have been the arms dealers who have fuelled and facilitated war and oppression around the world. In a joint public statement, the defendants’ campaign said: “The CPS cannot dispute any of the findings of fact made at our trial concerning criminality at DSEI, or the high probability that weapons bought there would be used for war crimes. “How could they, when every credible authoritative source only serves to confirm that the UK government and other repeat DSEI invitees such as Saudi and its coalition allies are solidly and persistently complicit in the mass indiscriminate killing of civilians? 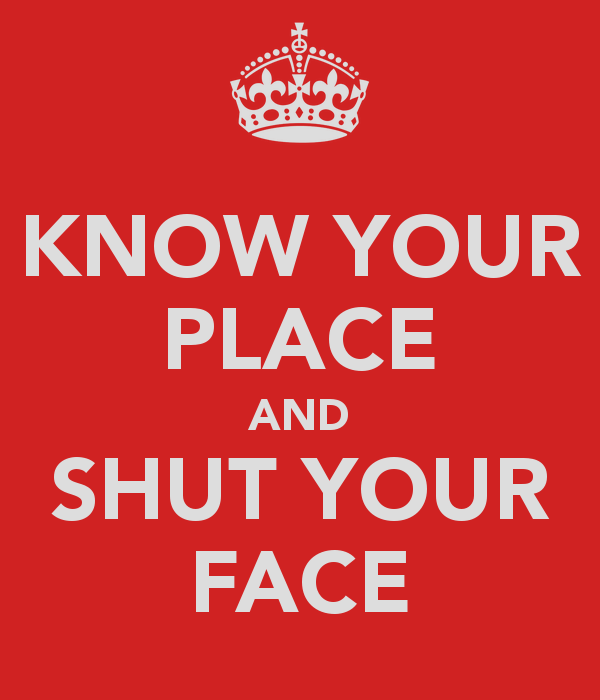 It is little wonder then, that the CPS should seek to prohibit the admission of such evidence in court on arbitrary procedural grounds, arguing that expert evidence should not have been allowed to be heard by the court at all. 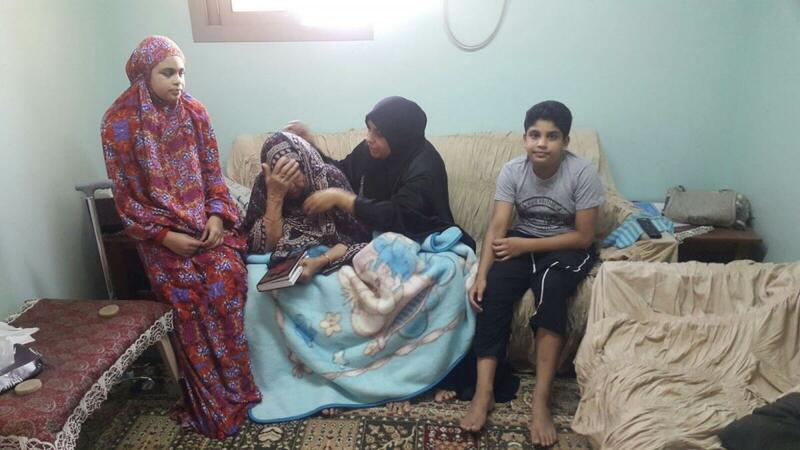 Hajar Mansoor Hasan (second from right), apparently targeted by authorities in retribution for the human rights work of her son-in-law, Sayed al-Wadaei. Also pictured are Hasan’s children, aged 13 and 11, and mother, 90. At the same time that the case against DSEI activists was being reopened, two family members of expert witness Sayed Ahmed al-Wadaei – who gave evidence at the activists’ trial – were detained by the Bahraini government in retribution for his speaking out about human rights abuses perpetrated by the regime. His mother in law and brother in law are still being held and there is grave concern for their safety following reports that they have been subjected to torture. More info on resistance to the 2017 DSEI arms fair here and here. 5. 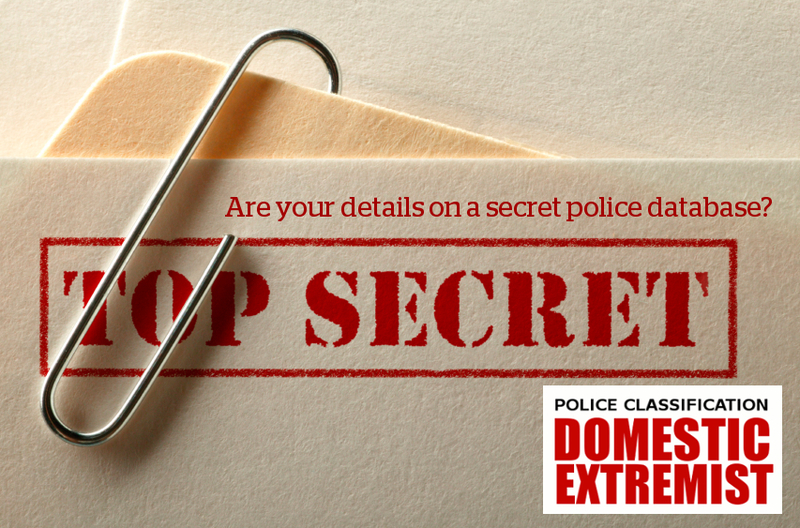 So what exactly is “extremist material”? The UK is ramping up its attack on online freedom, seizing on the excuse of last month’s Westminster Bridge attack to try and outlaw encrypted messaging. It is also considering legislation to force firms to “take down extremist material” from the internet, although details of what this might involve are not yet clear. The state’s definition of “extremism” has been left deliberately vague and in other contexts has already been applied to anarchism, anti-fascism and the growing frack-free movement. Banning this kind of political content from social media or other websites might seem to be out of the question in a country that likes to claim it is a “democracy”, but it would be in line with increasingly repressive official attitudes. After the Investigatory Powers Act was passed last year, no fewer than 48 government bodies – including the Food Standards Agency and Department for Work and Pensions – can view a record of the websites people have visited in the past year. 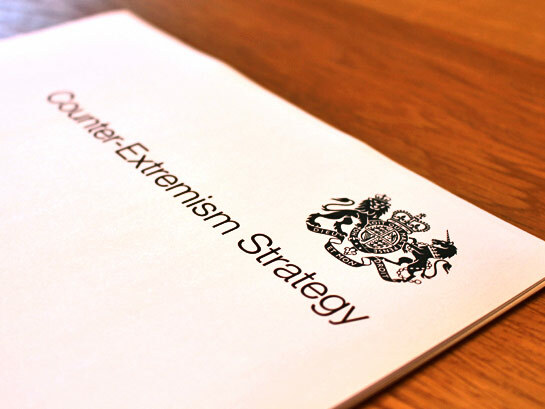 A year and a half ago, Theresa May launched a “counter-extremism strategy” which amounts to a McCarthyite witch hunt which The Guardian described as being targeted “against ‘entryist’ infiltration of the public sector, charities and businesses by Islamist and other extremists”. The term “other extremists” stands out here. The UK Government defines “extremism” as vocal or active opposition to what it calls “fundamental British values”, by which it of course means the “values” of the British state, such as waging imperialist wars and protecting the arms trade that profits from them (see above). Police monitoring group Netpol says it has spoken to many people “who are alarmed by the stifling of political debate in schools and in further and higher education – including discussion on issues like ‘eco-terrorism‘ and support for Palestine – and who are more worried than ever about attending political meetings or engaging in online discussion”. Does “removing extremism” from the internet simply mean trying to ban dissent? We can tell them now – it won’t work! 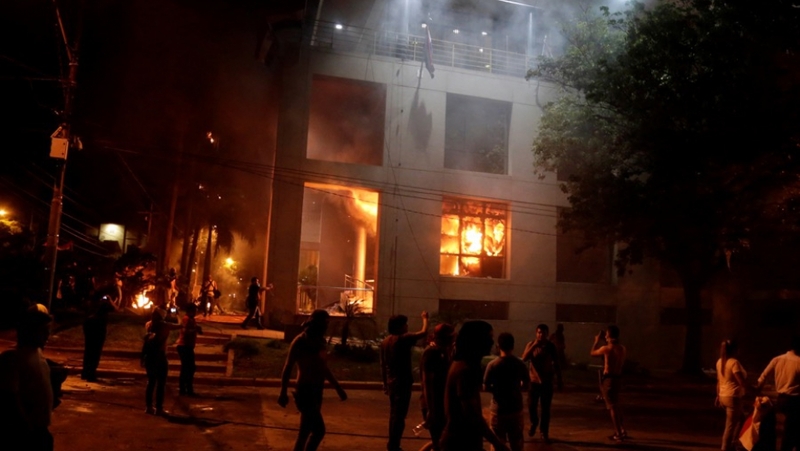 Hundreds of demonstrators set fire to the National Congress building in Asuncion, Paraguay, on the night of March 31, in a furious reaction to a secret vote for a constitutional amendment allowing right-wing President Horacio Cartes to run for re-election. A 25-year-old opposition activist was later shot dead during a police raid. 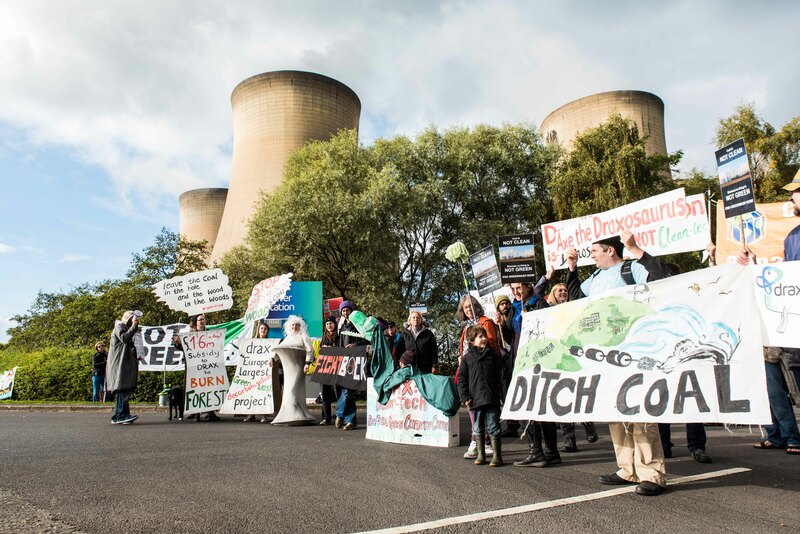 Two protests against the environmentally disastrous Drax Power Station will be held in the UK on Thursday April 13. One is planned for York from 10.30pm until 2pm, where Drax’s shareholders are meeting at The Royal York Hotel York (The Principle York), close to York rail station. On the same day in London a colourful protest will visit some of Drax’s key investors from 12 noon until 2pm – meet in Gresham Street. Pro-capitalist trade union GMB has called for police and courts to take “a firm line” against opponents of fracking, reports Drill or Drop. As we have previously revealed here, GMB is very much in bed with the oil and gas business mafia and has even done a deal with UKOOG, the front group representing the fracking industry in the UK. 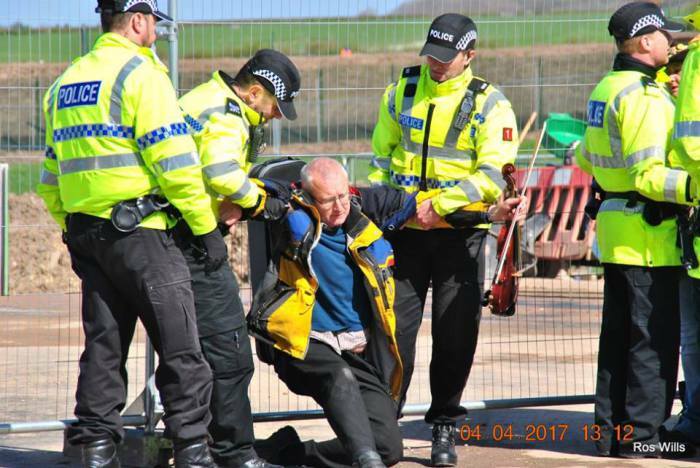 Freedom News commented that the sell-out union’s latest statement comes “in an apparent total disregarding of the long history of police dirty tactics breaking strikes and picket lines in Britain, as well as numerous reports of police misbehaviour against fracking protesters”. 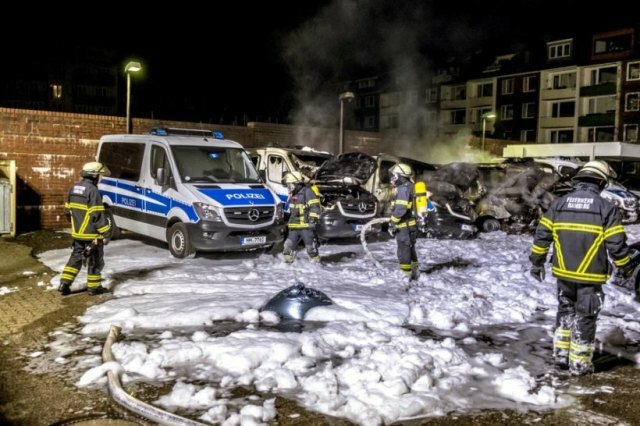 Anti-capitalists gearing up for the big protests against the G20 in Hamburg this summer launched a spectacular attack on a police station on the Grundstrasse in Hamburg in the early hours of March 26, setting the police vans in the yard on fire. 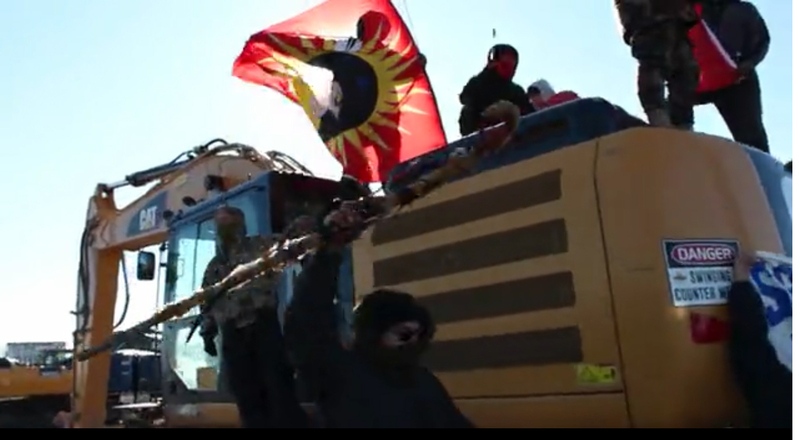 In a statement translated by Insurrection News, the activists explained: “Our target was selected with care, the repressive machinery has been working at full speed on the criminalization of the resistance”. A petition has been launched to save from closure one of the few museums in the world to be dedicated to the life and works of an anarchist. The Ferdinand Domela Nieuwenhuis Museum at Heerenveen, in the Netherlands, celebrates one of the fathers of Dutch anarchism and libertarian socialism, who was also active in the vegetarian and anti-militarist movements. The petition can be signed here. 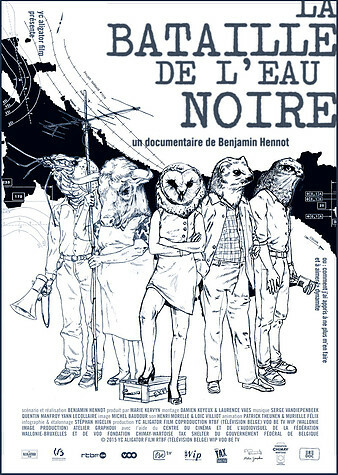 Indigenous resistance to industrial capitalism and the thorny issue of the “enemy within” in the shape of “Peace Police”, sell-out NGOs and corrupt “tribal government” – this is the subject matter of the first in a series of monthly documentaries by sub.media, going under the name of Trouble. Well worth a look! A pioneering UK academic publishing project is aiming to make first-rate scholarship on anarchism freely accessible through a sustainable publishing model. 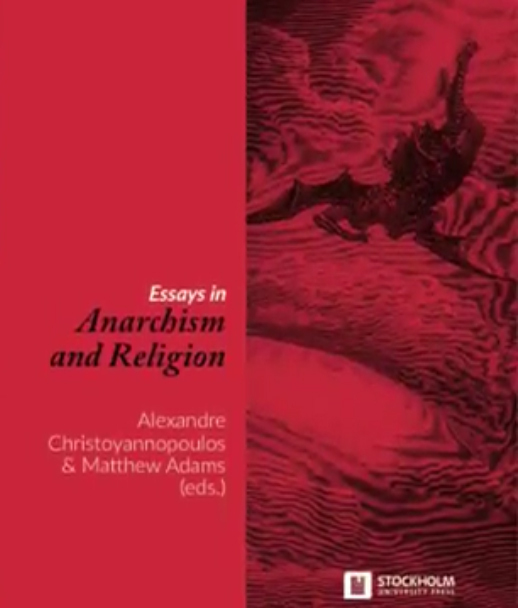 Alexandre Christoyannopoulos of Loughborough University explained that the first volume of Essays in Anarchism and Religion is already in production and now a crowdfunding scheme has been extended in a bid to fund the next two volumes. Acorn quote: “In a culture where profit has become the true God, self-sacrifice can seem incomprehensible rather than noble”.